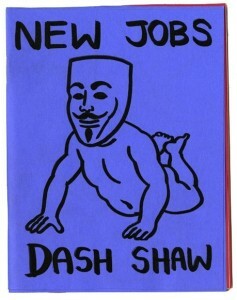 Dash Shaw has put out very little work since the 2009 release of his Unclothed Man in the 35th Century AD short story collection, and New Jobs is the first of the burst of new material he recently released that I’ve read, so I feel like I’m more or less back at square one with experiencing and interpreting his work. And that’s the biggest strength of Shaw’s comics- whether you enjoy them or not, they’re layered and complex in a way that fosters investigation and discussion. Even people I know who don’t enjoy Shaw’s work spend a few minutes explaining what they don’t like about it, seemingly unable to simply dismiss it. 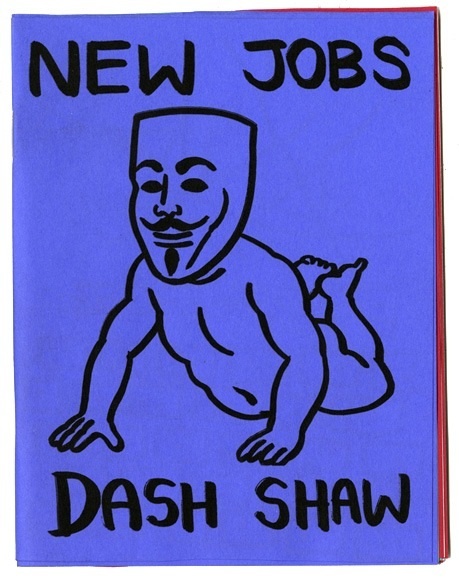 New Jobs is dense, packing a lot of moments onto each of its tiny pages, in contrast to the fluffier, widescreen cinema method of storytelling currently in vogue in mainstream comics. I call them moments instead of panels because there are no borders. In fact there’s a complete disregard for the grid system at work here. Moments are placed with only pacing in mind, which, in addition to the Sharpie-imbued smoothness of the drawings, gives the reading experience a fluidity that suggests a different cinematic experience- animation. The drawings seem to move as they melt into one another. Shaw has a similar stripped down approach toword genre. New School isn’t quite science-fiction, but he adapts the society the characters live in to suit the themes of the story. By only using the most efficient parts of the various storytelling strategies at play, Shaw has managed to pack a lot of ideas into a very small package.